When it comes to hair care there are many things I don't really want in my Shampoo and Conditioners because I have got to that stage where I know what my hair likes, I know what irritates my scalp and having combination hair - oily roots and dry ends, I need to be using products which don't excaebate the problems. This is where American English comes in. American English is one of those brands you might have seen in your Social Media feed, it is a vegan hair brand whose products are full of natural ingredients such as seaberry, baobab and quinoa and to ensure they tick all of the boxes, each product is formulated without parabens, phthalates, or sodium lauryl sulfate and the ingredients are ethically sourced. Giving props to nature, the experts behind American English use sustainably-sourced ingredients to create a revolutionary range of vegan haircare. Free from parabens and sulphates, the brand’s dry oil and sea-salt sprays are packed with vitamins that heart your hair, while its shampoos and conditioners breathe new life into washed-out locks. I have been using four products from the range, all of which are availble here at John Lewis and here at ASOS. As far as I am concerned you can never own too many bottles of shampoo, especially if you find a product you absolutely love. The American English Youth Repair Shampoo (£23) is designed to gently cleanse hair and not only aims to hydrate, restore elasticity and prevent breakage but also to repair damage, strength and add shine. Enriched with Vitamin A, C, E and Omega 3, 6, 7 and 9 as well as rosemary which helps to balance the pH. What I love about this shampoo, other than how incredible it smells, is that it is lightweight and doesn't weigh my hair down. It also doesn't take an age to rinse out of my hair and because of the ingredients it is enriched with, ive found my hair an absolute breeze to style. When it comes to using a Conditioner, I don't use one everytime I wash my hair, instead it is something I use every other to every two washes. 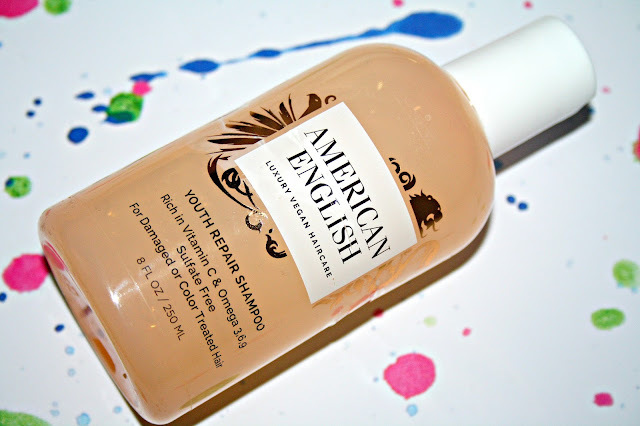 The American English Youth Repair Shampoo (£25) compliments the shampoo in that it aims to hydrate, restore elasticity and prevent breakage but also to repair damage, strength and add shine. Again it is enriched with Vitamin A, C, E and Omega 3, 6, 7 and 9 as well as rosemary which helps to balance the pH. With this Conditioner it is one of the lightest I have ever used, almost weightless when on the hair, I apply it to my mid-length and ends and then any that is left over on my hairs, I sometimes run through my hair with my fingers. This is a shampoo which really does help with the frizz, I will always have flyaway bits of hair, but the frizz can be tamed and this Conditoner helps with that. Having greasy roots, the last thing I ever expected to use on my hair is an Oil, fearing those greasy locks would turn greasier, lank and dull. 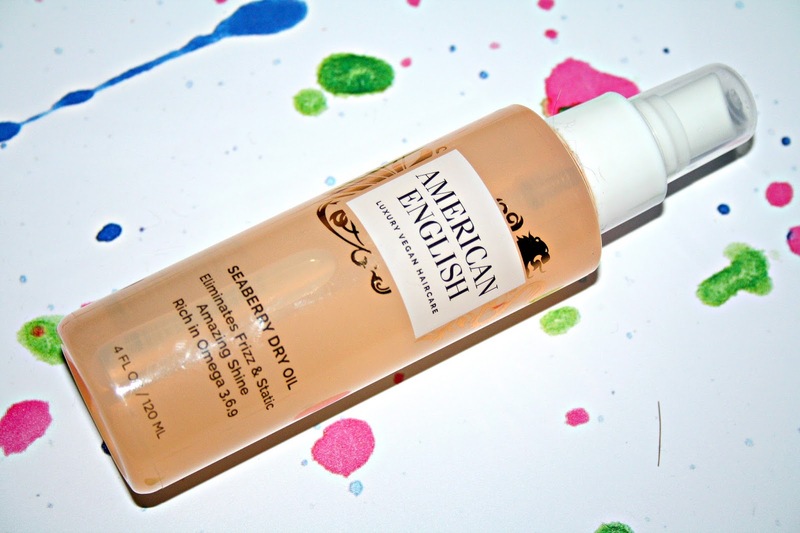 Not so with this American English Seaberry Dry Oil (£25). If ever there was a product I wish had been turned into a bath soak, this is it because it smells just divine. Designed to eliminate frizz and static from hair as well as add shine, strength and rejuvenate the scalp, this multi-tasking spray is a lightweight formula rich in Omega 3, 6, 7 and 9 as well as seaberry, amino acids, olive oil, jojoba oil and avocado oil. This oil isn't greasy, it doesn't weigh the hair down and it can be used as a shine spray, style finisher or as a heat protector with a recommendation that it works its best as a second day re-styling spray. 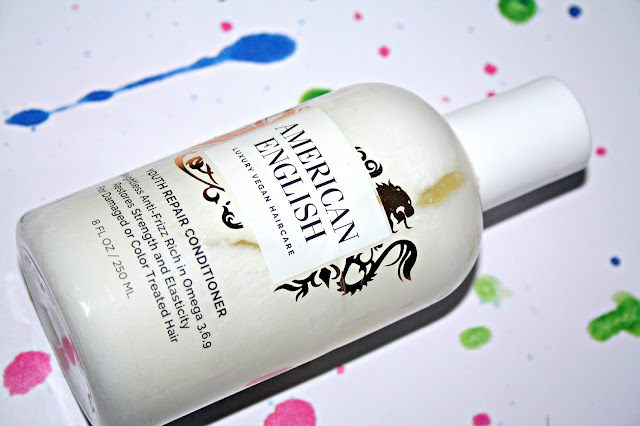 The final product I have been using is the American English 24 Karat Thickening Lotion (£25). This is quite different to any other product I have used on my hair and what makes it different is that it is described as being a revolutionary lightweight water based formulation which is not only designed to add volume while protecting the hair but to also provide flexible hold when used with heat styling tools..
Non-sticky or tacky when used, I love ths shine it adds to my hair and I love how smooth my hair feels when it is used. I apply this spray to my hair whilst it is still damp and then, once I have blow dried it, I find my hair straighteners run glide through my hair. As with the rest of this range, this lotion is enriched with vitamin A, C, and E and Omega 3, 6, 7, and 9 as well as seaberry which works to lock in hydration and prevent breakage. 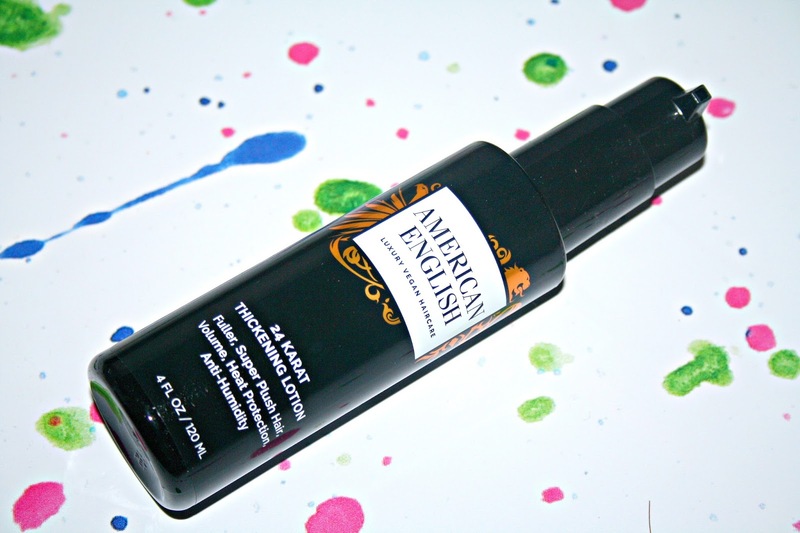 As I have mentioned already, American English hair care products are formulated without parabens, phthalates, or sodium lauryl sulfate. I have noticed a difference in how my hair shines when I use these products and anything that doesn't make my roots greasier, irritate my scalp but manages to control my frizz and static will always get a huge thumbs up from me, especially when it smells as good as this collection. I'm hearing such good things about this brand and I love the sound of the products you've mentioned! I have oily roots and dry ends too so love the sound of that hair oil particularly! I've never heard of this brand before but my hair is so damaged from my last pregnancy these sound exactly what my poor hair needs. The one for damaged hair sounds so good! 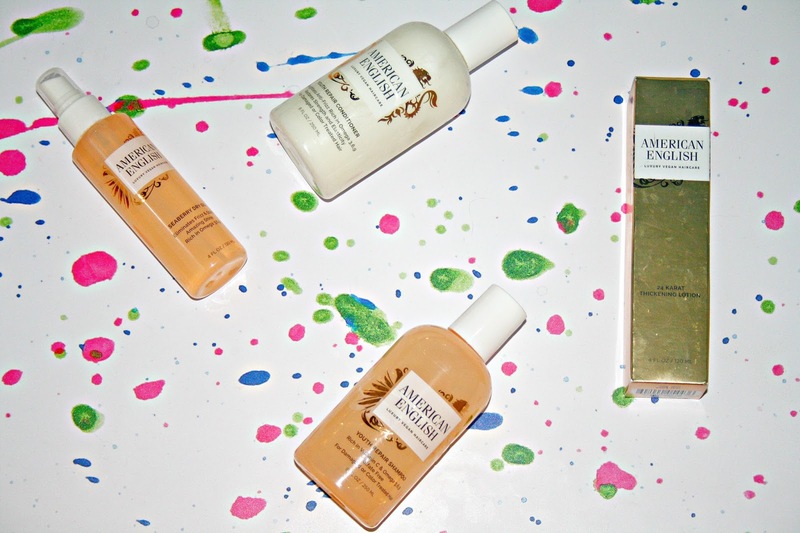 I love finding brands I've never heard of through your blog.